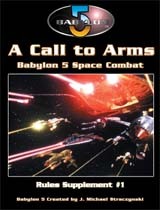 The perfect companion to the Call to Arms space combat game, these Rules Supplements will form an irregular series charting the development of this game. Each will be jam-packed with new scenarios, rules, campaigns, ships, weapons and modelling ideas for your fleets. In this first issue we look at, among many other things, revised White Stars, space stations, battles in hyperspace and, to top it all, there is a complete campaign for you to get your teeth into, as well as some advanced rules for you to try in your games!